Watching the sunrise on the Ponte Vecchio, one of Florence’s oldest bridges, is a great way to start the day. 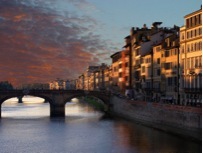 The dawn light surfs the dark waters of the Arno River and the sky splits open into color. 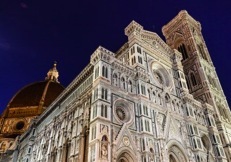 On your way to the bridge, you’ll have the delight of the Duomo all to yourself: without being surrounded by tourists snapping pictures, Florence’s architectural landmark looks even more beautiful and majestic. After the sunrise, if you walk back the way you came, you’ll run into il Porcellino, Florence’s gold boar. With no one around, have your own silent exchange with the boar, rubbing its nose for good luck and the promise of a return to Florence. By then, surely you’ll be hungry! Ask around for the lampredotto stall under the arch. Don’t worry, any local you ask will know the way. Ignore your suspicions as you find the sketchy window in a dark alleyway, and ask for the Florentine delicacy: cow stomach chopped up and stewed, then placed in a roll and covered with special sauces. It sounds terrible, but for just €4, I promise you it’ll be like heaven on earth. Having walked and eaten, it’s time to sit: buy two bus tickets, for €2.50, and head to Fiesole, the commune next to Florence, which is actually much, much older than the city itself, dating to the Etruscans, the mysterious civilization that preceded Rome. Explore the ancient theater and its ruins, get a coffee if you feel like it, and wait for the sunset. The view from up there is fantastic. As the night creeps in, head to where the real Florentine nighttime is, the Santo Spirito plaza across the river. Get a drink, and mingle with Florentines as you listen to live music coming from the bars. And smile to yourself as you realize that your entire day cost barely €11. Just desire to say your article is as surprising. The clarity in your post is simply nice and i can assume you’re an expert on this subject.